This is a compact, packaged, and assembled unit. 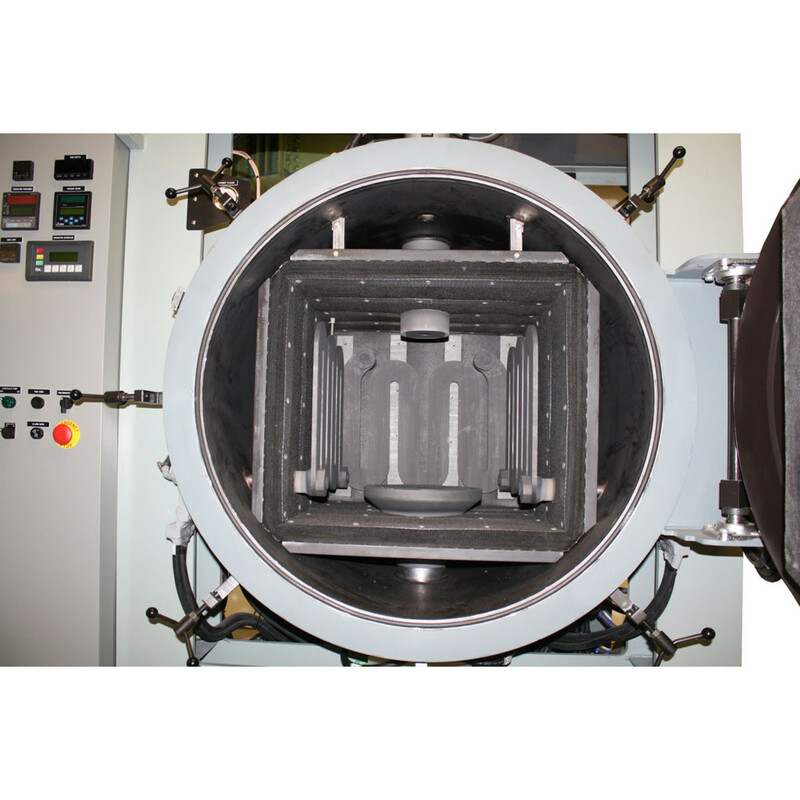 Graphite hot zone and four-sided graphite heating elements for optimum uniformity. Upper ram is moveable with 6” stroke. Bottom ram is fixed. Fully automatic operation with PLC programmer/controller with alphanumeric display to indicate hot press processing cycles. Programmable closed-loop temperature/pressure control. 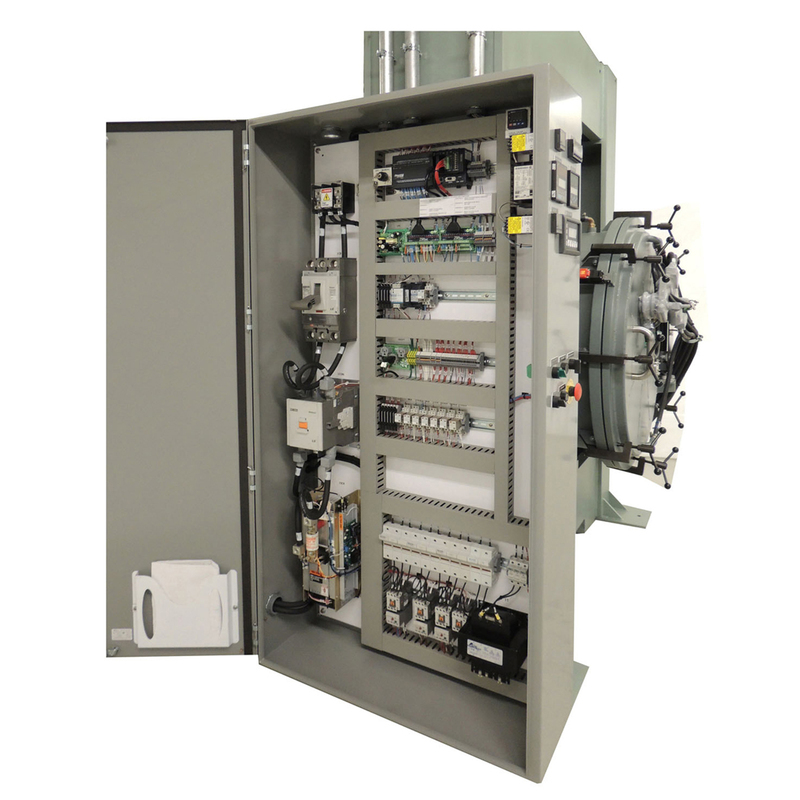 This system will consist of a Yokogawa UP750 two-loop programmable temperature controller with 300 programs and 3,000 segments. The UP750 will control the temperature and the pressure on the hydraulic ram on the same timeline. High vacuum operation. 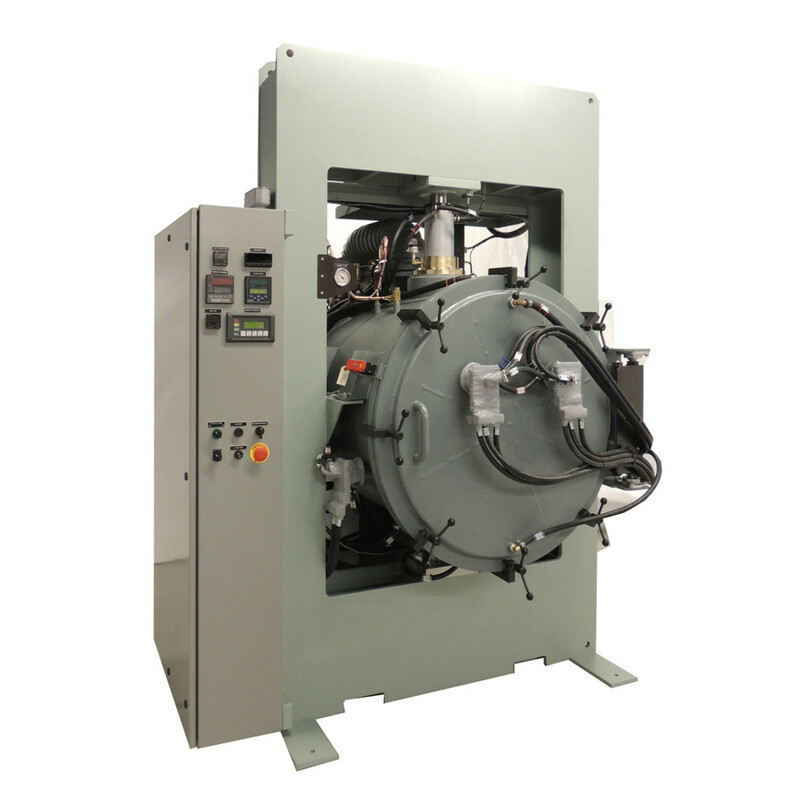 Includes 6” high-speed diffusion pump, high-vacuum gate valve, foreline valve, and all necessary vacuum plumbing and automation to enable the system to operate in high vacuum. Liquid nitrogen cold trap with digital temperature controller to minimize liquid nitrogen consumption. Digital ram movement indicator with resolution to the nearest .001”. Digital vacuum gauge with a range of atmosphere to 1 x 10(-5) Torr. Digital high-limit safety controller with Type “C” thermocouple. We provide written operating procedures, complete detailed electrical schematics, and manuals for all instrumentation and controls on the hot press. Includes one day of test fire and operator training at our plant in Terryville, Connecticut, USA. 2200o C operation (3992o F). Includes automatic thermocouple retractor and optical pyrometer. Remote diagnostics via a modem, enabling us to remotely aid in troubleshooting the hot press and guide your maintenance people directly. This should virtually eliminate the need for field service. Yokogawa Light Loader to facilitate uploading and downloading programs, configuration files, and auto-tuning parameters. This device clips on the face of the Yokogawa UP750 instrument and plugs into a USB port on a PC-based laptop or desktop computer, greatly facilitating and simplifying instrument configuration, program storage, and auto-tuning. Can be used for writing programs and storing detailed configuration data.